Traditional RIAD of 1903 of 210 m2, everything of full foot, who to keep his architecture of origin in spite of several restorations(caterings), it understands a big central patio (as any real riad, four trees and a central fountain), it also benefits from a terrace of 120 m ², it is directly placed in the heart of the medina of MARRAKESH in BAB DOUKALA's district, in 10-15min on foot of the Place(Square) JEMAA EL FNA. The AMETHYST RIAD is only praised in full for you with the breakfast!!!! PRICE according to duration and the number of persons. 35€ the simple room by overnight stay, 70€ the double room by overnight stay. The WEEK 1 person 245€, the WEEK 2 persons 460 €, the WEEK 3 persons 535 €, the WEEK 4 persons 610 €, the WEEK 5 persons 685 €, the WEEK 6 persons 760 €. The yard is a cool & quiet paradise with a tall palm tree, bamboo and 2 bitter orange trees which fill the house with fragrance after dark. The view upwards into the blue sky is mesmerising and you will occasionally spot the odd stork, bird of prey, swallows and flocks of Bea-eaters. A tame pair of house buntings also live in the yard and will often hop around you in search of insects. Upstairs the private terrace is sunny during the day and starry at night. Cats patrol the top of the wall. The bedrooms are comfortable, cool in the day & warm at night, with good mattresses. Sleep quality is excellent. The toilets are clean with is 24hr hot water. The kitchen is fully equipped including an orange juicer. Hafid– the caretaker - is amazing. Discreet, calm and friendly, he will prepare your breakfast every morning (coffee, tea, milk, freshly, orange juice, bread, jams, honey and some very nice flat pitta bread. He can arrange home cooked meals delivered to the riad. He will give you advice and if you wish arrange everything such as taxis, camel trips, sightseeing . He speaks a bit of English too. The neighborhood is less touristy than other areas in the Medina & the shops are aimed at locals. You can find everything for your daily supplies. ATM 5min on the road which runs along the walls towards Bab Doukkala. 3.The little BBQ place. Exit the riad & turn into the 2nd left (Rue El Gza). It’s on the left a few yards down, run by 2 polite, friendly brothers. It serves tiny skewers in a flat bread. Ask for 4-8 skewers for each sandwich. They are fantastic & very cheap! 4.The fried fish places on the road parallel to the wall towards Bab Doukkala. Buy by weight a selection of different small fried fish. A takeaway for 4 with some aubergines, bread and a couple of chilies will cost around 40 MAD. Location is excellent as its walking distance to taxis and buses. If you are driving in the 24hr parking is 5 min walk. Walk within 15min or taxi 5min to main square, main souks and tourist sites. The Riad has a nice feel to it. Though in a busy medina its very quiet. Decor is very tasteful. Beds are comfy and the double bedrooms are heated. The caretaker was very nice and helped for all things local. Checkin and checkout was a breeze. 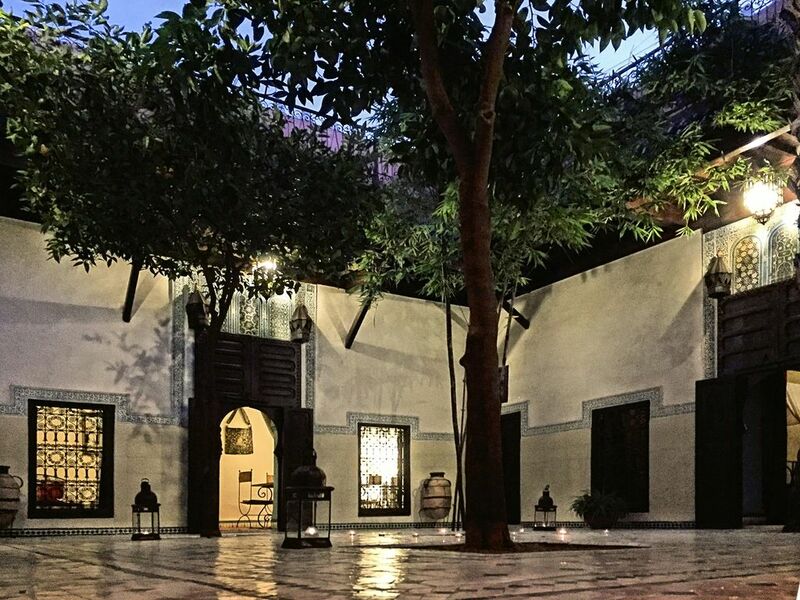 "Riad beautiful, with every comfort, excellent location. Hafid preson is a delightful, polite and helpful. Riad just needs a good general cleaning, overall very good accommodation." "Amethyste Riad is beautiful, traditional and peaceful. It has everything required and is clean. It has a bathroom and a seperate shower rooom with lashings of hot water. Only one toilet to share. We were warm at night with electric heaters. The beds are comfortable and firm. Hafid comes every morning and makes breakfast. He looked after us very well and was so helpful. One night he arranged for a tasty targine to be made and we ate in the Riad. We would definately book this Riad again." Since the airport or the GUELIZ to follow the direction of the bus station, then to cross the ramparts of the medina to enter by the NORTH DOOR IS of BAB DOUKALA, since the big taxis to take the street El Gza, Riad is in 200m on your right at the bottom of an impasse.